It is undeniable that sunscreen lotions and sunblock lotions can help prevent sunburn and skin damage. Using sunscreen lotion (topical sunscreen) can be an important precautionary measure in protecting sensitive skin from the harmful effects of the sun, including burning, aging, and skin cancer. Many experts recommend the use of a non-toxic sunscreen lotion whenever there is a chance of getting sunburned. The problem is that non-toxic sunscreens can be difficult to find. Many sunscreen lotions are unstable, toxic, and only moderately effective against UVA rays. For further information on sunscreen toxicity and other concerns about sunscreen lotions, expand the respective sections below. The Recommendations section at the bottom has information on which sunscreen lotion active ingredients you should use. It has been clinically shown that most conventional sunscreen lotions break down in the sun. But not only do common sunscreen components including avobenzone, oxybenzone, dioxybenzone, octocrylene, and others lose their effectiveness when exposed to the sun, they are actually unstable—breaking down and creating free radicals and reactive oxygen species. These harmful effects have been demonstrated in many studies, demonstrating the damaging effects of photo-excited sunscreen ingredients on living tissue and implicating these chemicals as potential photocarcinogens! Similarly, Vitamin A (retinal) and Vitamin A derivatives (including retinol and retinyl palmitate) in sunscreen lotions have also been shown to be photo-unstable. Many popular sunscreen products contain Vitamin A or its derivatives, which research has recently revealed may actually increase the damage to your skin. Some of the ingredients in sunscreen lotions penetrate your skin and enter your bloodstream. These unhealthy ingredients can cause unintended effects, including interfering with your body’s natural hormone systems. In fact, according to the Centers for Disease Control (CDC), oxybenzone can be a hormone disruptor; its detection in pregnant women correlates with lower baby birth weight. Furthermore, according to the Environmental Working Group, an advocacy organization based in Washington, D.C., about 9% of the oxybenzone applied to skin soaks through it into the bloodstream. Sunscreens also commonly contain many structurally and functionally similar chemicals to oxybenzone, including dioxybenzone and other benzene derivatives, which act in a similar manner to oxybenzone in your body. While avoiding sun exposure is ideal, using sunscreen lotion is still almost definitely better than getting badly sunburned. But if you need to use a sunscreen lotion, many experts suggest using a product with zinc oxide (or zinc oxide and titanium dioxide together), which offers full-coverage (UVA and UVB) protection from the sun. Zinc oxide also doesn’t seem to have negative health concerns, and has been shown to be much less likely to break down (has greater photo-stability) in the sun than other traditional chemical sunscreens. Make sure, however, that the product you use doesn’t contain any of the potentially toxic compounds discussed in the sections above. Furthermore, choose a product that doesn’t contain retinal, retinol, or retinyl palmitate, and doesn’t use micronized zinc oxide or micronized titanium dioxide. 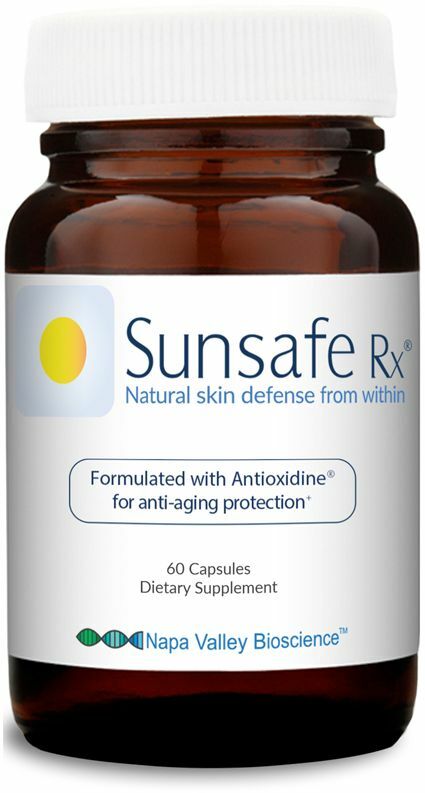 Sunsafe Rx is a healthy addition to your everyday anti-aging routine that may also include a zinc oxide/titanium dioxide sunscreen lotion. Of course, you should also use other methods of sun protection (like covering up), and in general avoid excessive sun exposure if at all possible.